The Finnish smartphone brand, Nokia made a grand comeback with the launch of Nokia 3, Nokia 5, Nokia 6, and the iconic Nokia 3310. However, global availability of the phones was pushed to Q2 2017. Various rumours appeared online claiming that the phone would be up for purchase by the end of May, but that seems to be changed now. The iconic Nokia 3310 is listed on various European e-commerce sites. Surprisingly, the listing shows a different price tag than what it was actually launched for. HMD Global, at the MWC 2017, announced the phone’s price as 49 Euro, but the listed price in slightly higher. In Austria, the phone was listed for 59 Euro and will be sold from April 28. However, some sites listed the phone for just 53 Euro to attract and some retailers even recorded it for the base price. The phone is listed for 58 Euro in Germany, and a customer can purchase it from April 28. Furthermore, several Swedish retailers listed an unannounced 3G version of the feature phone for 93 Euro. That’s a whopping price tag for a phone that has limitations. There’s no official announcement on the existence of a 3G variant, though. The price differences mentioned above could be for various reasons. For example, the taxes of German government are different, when compared to other countries. The Indian pricing of the phone is still unknown, and the availability date is a mystery as well. 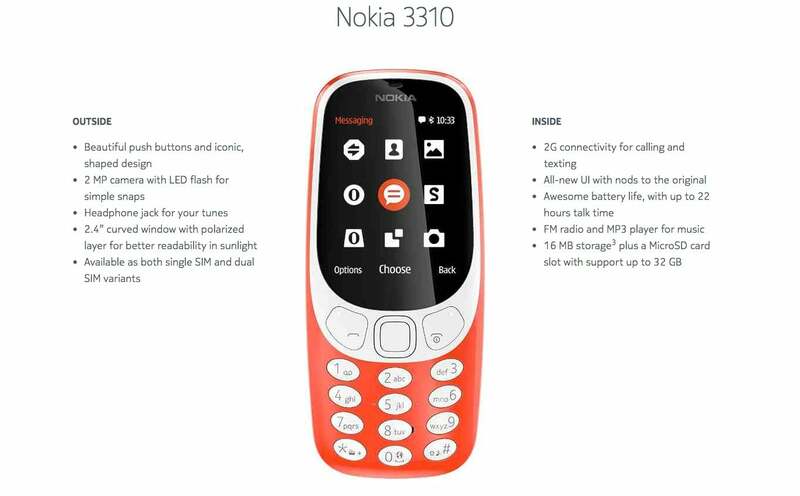 Various speculations said that the Nokia 3310 would be sold ahead of other Nokia phones by April end. But, there’ still no information regarding the same. A latest rumour revealed that HMD is looking to sell the phones in India alongside other upcoming Nokia phones such as the Nokia 7, Nokia 8, and flagship Nokia 9. Both the Nokia 7 and Nokia 8 are said to feature dual rear cameras and Snapdragon 660 or Snapdragon 626 SoC. The flagship Nokia 9 will also come with dual rear cameras, Snapdragon 835 SoC, Iris scanner, 3,800mAh battery. Nokia is said to launch them in mid-June. I booked one set at Nokia priority, i noticed significant number of peoples booking it in advance. I asked many of them it does not have VOLTE then why buying? Mostly public replied they dont want VOLTE in it. They want 2G superb countrywide connectivity..